Author(s): Evangelia Kolega, National Technical University of Athens, 9, Iroon Polytechneiou st. 15773, Zografou, Athens, Greece. Vassilios Vescoukis, Yannis Xydas. High Density WSN deployments applicable to large scale area extent is a venture of vital importance for a number of critical infrastructures. National borders monitoring, prediction and prevention of natural disasters and even crisis management issues comprise the wide application filed. Because of the critical role of the application and for expense reasons as well, the efficiency of the network should be assured. Emphasis has been given to connectivity and redundancy concerns, as they constitute the main contributory factor to a fully operational network. Therefore, topology, with respect to simulation issues, includes all the aforementioned terms. In this paper, we analyze the extended grid of cells topology with overlaps and its enhancement, with the aim to reduce cost and increase the response time of a monitoring network, which mainly acts as an early warning system. The proposed topology meets the specific problem requirements of large scale area coverage with high density sensor networks and provides a feasible and an efficient solution to it. This topology is applied in an expandable way, taking into consideration simulation results. The proposed network architecture combines the node signal attenuation with its localization for redundancy sake. The topology resembles the cellular phone network architecture, yet it is deployed according to WSN characteristics and limitations. It constitutes the fundamental – theoretical topology approach upon which elevation and trees location will be taken into consideration in the forthcoming research. As a result, an appropriate WSN topology with increased efficiency and reduced cost per particular area is proposed. What is more, estimations and quantitative analysis regarding network devices and installation procedure are performed. 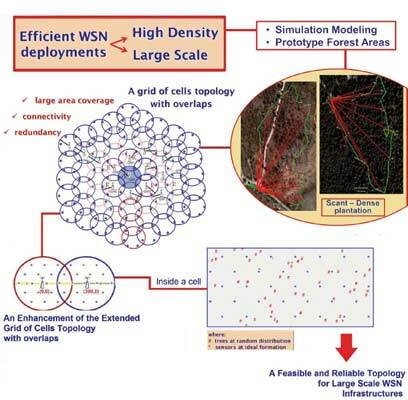 Keywords: Cell, connectivity, efficiency, grid, high density, large scale, overlaps, redundancy, topology, WSN. Affiliation:National Technical University of Athens, 9, Iroon Polytechneiou st. 15773, Zografou, Athens, Greece. Keywords:Cell, connectivity, efficiency, grid, high density, large scale, overlaps, redundancy, topology, WSN. Abstract:High Density WSN deployments applicable to large scale area extent is a venture of vital importance for a number of critical infrastructures. National borders monitoring, prediction and prevention of natural disasters and even crisis management issues comprise the wide application filed. Because of the critical role of the application and for expense reasons as well, the efficiency of the network should be assured. Emphasis has been given to connectivity and redundancy concerns, as they constitute the main contributory factor to a fully operational network. Therefore, topology, with respect to simulation issues, includes all the aforementioned terms. In this paper, we analyze the extended grid of cells topology with overlaps and its enhancement, with the aim to reduce cost and increase the response time of a monitoring network, which mainly acts as an early warning system. The proposed topology meets the specific problem requirements of large scale area coverage with high density sensor networks and provides a feasible and an efficient solution to it. This topology is applied in an expandable way, taking into consideration simulation results. The proposed network architecture combines the node signal attenuation with its localization for redundancy sake. The topology resembles the cellular phone network architecture, yet it is deployed according to WSN characteristics and limitations. It constitutes the fundamental – theoretical topology approach upon which elevation and trees location will be taken into consideration in the forthcoming research. As a result, an appropriate WSN topology with increased efficiency and reduced cost per particular area is proposed. What is more, estimations and quantitative analysis regarding network devices and installation procedure are performed.